Shipov’s commentary in the original Russian can be found here at Crestbook, where you can also play through all the moves and analysis. At the end of my translation I’ve also included the video report that Sergey produced after the game. Good day, dear friends! It’s got much colder here in Moscow, but in Kazan it’s still hotting up. This is Grandmaster Sergey Shipov starting coverage of the final classical game of the Russian semifinal. Of course I’m not going to ignore the battle of the international pairing either, but I won’t manage to split into two. I’m going to place the emphasis on the game between Kramnik and Grischuk. The score is even in both matches at the moment. Those playing White have an excellent chance of breaking through to the final today, without allowing things to get to tie-breaks. But if they press too hard – then those playing Black also have a chance! The responsibility is, of course, very large. Much larger than in any game in any tournament. What’s at stake, here and now, is extremely important: the final of the Candidates Matches! Not everyone’s capable of handling such tension, but in Kazan we’ve got hard-baked, experienced fighters with strong nervous systems. I think they’ll withstand the tension and demonstrate a good level of chess even at the decisive moment. 1. Nf3 c5 Note the move order. Grischuk doesn’t want to go for the Anti-Grunfeld (i.e. he’s not playing 1…Nf6 with 2…g6 to follow), but he’s politely inviting his opponent to switch to the Sicilian Defence. 2. c4 In his time Kramnik played 1. e4 in general, and the Sicilian in particular. But now he’s brought an end to those experiments, returning to his native closed openings. On the board we’ve got the English Opening. 2…Nc6 3. Nc3 e5 Black is actively fighting for space, unafraid of weakening the light squares. 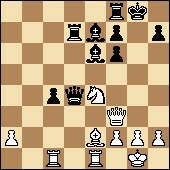 4. e3 Nf6 5. Be2 A local surprise. 5…d5 White has delayed a strike in the centre, so Black is preempting him. 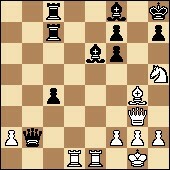 A pleasant circumstance for Black is that after exchanging on d5 White won’t bring the bishop to b5. You’ll agree it would be silly to have lost a tempo by stopping on e2. A good counterblow. Lots of exchanges are in the air, but as White had the right to make the first move he preserves an initiative. 6…exd4 Judging by the speed of play, for now both players are following what they’d worked out at home. Moreover, the position has been seen more than once before, though it doesn’t have a long history – a mere couple of decades. From the end of the last century. 8. Be3 The grandmasters are methodically strengthening the centre, not rushing to make new exchanges as those would, after all, help the opposing side to develop. At this point and suddenly, as always, Grischuk has started to have a serious think – before theory had even thought of coming to an end. 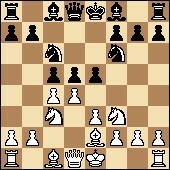 Previously here people would usually exchange pawns – on c4 (most often), or on d4. It’s hard for Black to maintain the symmetry for long, and also dangerous. 8…dxc4 Following the main line. 9. 0-0 By completing development White is getting ready for a decisive attack in the centre. Black won’t manage to deploy his forces comfortably. He’ll have to make concessions. 10. Nxd4 Nxd4 11. Bxd4 White’s initiative is quite serious. The pawn hasn’t been sacrificed in vain. As you can easily spot, we could get the same position as in the old Topalov – Leko game, via a transposition of moves. That’s if Black modestly brings out the bishop to e7. But there’s also the more ambitious move 11…Qd7, preempting the diagonal check by the white queen and preparing to castle long. Sasha is again taking a long think… Or rather, he’s recalling, rechecking and selecting. The difference in the times isn’t growing by the day, but by the minute: 1:53 – 1:30. 11…Qa5 He’s gone his own way. Also not a novelty. The black queen is again not allowing its opponent to get to a4, and is again freeing up the king’s path to escape to the queenside. And, by the way, that flight will create an unpleasant pin for White on the d-file. 12. Bxf6 So there’s no-one to pin. 12…gxf6 And moreover Black’s structure isn’t ideal. 13. Re1 Kramnik’s response was lightning fast. Vladimir Borisovich likes to demonstrate confidence at the board. That’s a means of putting psychological pressure on his opponents. As if to say, look, I’ve analysed everything. Everywhere you go computer-checked lines await. If you remember, in the first game such an approach upset Sasha and provoked him into offering a premature draw… White’s move has created the threat of taking on c4. It’s a novelty! Now I’ll see where it came from. I turn on my computer engines and they show 13. Re1 as the first line! Checked and confirmed. This time there was no half-hour think. And that’s a good sign for Grischuk’s fans. 14. Qc2 Played after a short pause. 14…Be7 The c4-pawn remains afloat – that’s where all Black’s hopes lie. The execution of prepared moves has ended for both sides, so now independent play is beginning. The clock situation is typical of the match: 1:46 – 1:04. Meanwhile, there’s been an unexpectedly quick draw in the Gelfand – Kamsky encounter. It seems as though Gata has finally studied the opening! He was the first to surprise his opponent and achieved equality. And Boris preferred not to be stubborn. So then, we’re guaranteed at least one tie-break tomorrow. 15. Qe4 To the right again, but by a slightly different route. The c4-pawn is under attack. And not only that – note the threat of capturing on b7. The third idea is the Be2-g4 thrust. The exchange of light-squared bishops might really hurt Black. And all three threats can be deflected by the simple reply 15…Qb6! with the counterthreat of Rd8-d4. 15…Qc5 Another surprise. A conceptual decision! Sasha is ready to give up the b7-pawn, but maintain the fighter on c4, which will cramp White’s queenside. For now 16. Bg4? is no good because of 16…f5! This capture was asking to be made, if only to free up the e4-square for the knight i.e. White isn’t only chasing after material, but also keeping the initiative. 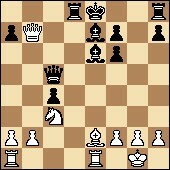 Now, as well as castling, Black should consider the limiting move 16…f5. Although… express-analysis shows that castling also isn’t bad. White can win a pawn there, but immediately comes up against an unpleasant initiative for Black. It’s easy to underestimate the powerful pair of bishops, but harder to pacify them when they go on the rampage. Having dug a little deeper into 16…f5 I found an opportunity for White not to take, but to sacrifice – and not a pawn, but a whole knight. And then you can develop what appears to be a dangerous attack… I must show you it! 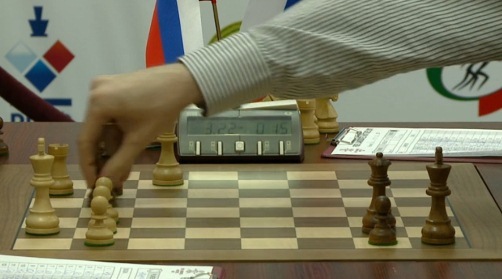 Grischuk is continuing to use up a lot of time: 1:32 – 0:43. He can’t make a mistake, as against the backdrop of chess problems time trouble would become fatal. 16…0-0 Well, from the point of view of king safety that’s the right decision. White is being offered a pawn via 17. Ne4 Qb4 18. Nxf6+. But is that good? I don’t think so… The alternative is to return the queen to f3. That would be in Kramnik’s style. 17. Ne4 And nevertheless! Kramnik has decided to test out the principled lines in real life. 17…Qb4 There was nothing else. 18. 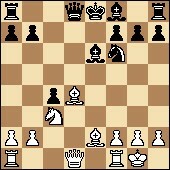 Qxa7 Probably the most harmless move – for White. He’s taken another pawn, is threatening to break the lifeline between the b4-queen and the e7-bishop with a2-a3, and has maintained the option of returning the queen to base – on e3. The white queen is at the crossroads. Should it remain in the enemy’s rearguard, or return to its own camp to be on the safe side? In any case, the b2-pawn won’t survive, or Black will get a threatening initiative in exchange for the temporary absence of a pawn. The clocks are a multiple of each other: 1:00 – 0:30. Isn’t it time for Kramnik to offer a draw? Before it’s too late… After all, you could end up worse if this goes on. And no threat of time trouble will stop Grischuk. 19. Qe3 Vladimir’s not going to overstep the mark today. He senses danger from afar. 19…Qxb2 20. Rac1 Destroying the c4-pawn means drawing the game. An attempt to answer fire with fire. It looks as though Kramnik is intending the manoeuvre Ne4-g3-f5, in order to pacify Black’s potentially strong dark-squared bishop. Grischuk is within his rights to consider the fierce counterblow f6-f5, with the idea of bringing the bishop out to g5 after Ne4-g3. 21…Rc8 Grischuk decided not to go for it and has played more solidly. It’s easy to understand him. He’s not on a park bench playing for seeds… And time is pressing: 0:40 – 0:18. 22. Ng3 As was to be expected. It’s not pleasant to remain under the constant threat of f6-f5. How should Black react? A knight invasion on f5 is on the cards. The most accurate and forceful reply is 22…Qe5! The point is that taking on c4 leads to mate on the back rank. 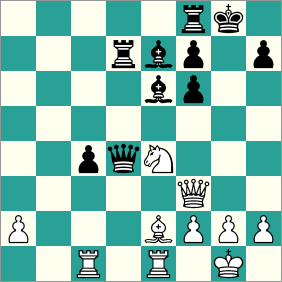 But there’s also a simpler move – 22…Rd5. In any case, you want to take control of the f5-square. 22…Rdc7 The pressure of time trouble is having its say. Grischuk has rejected all the principled responses, agreeing to an exchange of one of his bishops. The situation is turning in White’s favour… The clocks are showing a palindrome: 0:31 – 0:13. Sensing the indecision of his opponent, the ex-World Champion has started to play for a win. And quite boldly. A knight on the rim is always a strategic risk, particularly in such an open position. Plus the survival of Black’s bishop pair is also no small factor. 23…Kh8 A quick and strong response. The king has to be hidden away. 24. 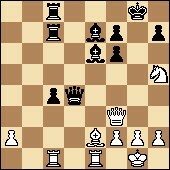 Rcd1 Going for a direct attack. The General Staff’s plan is that the threatening c4-pawn won’t manage to creep to c1. 24…Qb2 But here’s an inaccuracy. The queen has moved too far away from the flashpoints. 25. Qg3 Highlighting those very flashpoints – g7, c7, f6. And Black’s king itself is also in a dangerous position. 25…Bf8 There was nothing else. A very risky move! Kramnik’s got a taste for it. He’s ready to risk, knowing that it’ll be very difficult for Grischuk, with his limited time, to calculate all the critical lines. Here the effect of the unexpected is also particularly important. Something his opponent hasn’t looked at might turn out to be the strongest move. Even if, from an analytical point of view, it’s not the best. Now, with the accurate reply 26…c3, Black can seize the initiative. But will Alexander find it? 26…c3! Yes, he managed! The clocks are already on fire: 0:20 – 0:06. 27. Bxe6 You have to finish what you started. 27…fxe6 28. Nxf6!? The speed of Kramnik’s play is impressive. He’s clearly playing “on the flag” of his opponent. In the style of the landscape-gardening school. But at the same time he is, of course, creating concrete tactical threats. 28…Bg7 Sasha doesn’t have enough seconds for accurate replies. 29. 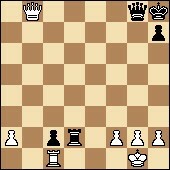 Nh5 Exchanging the bishop will both weaken Black’s king and make it easier to stop the c3 passed pawn. 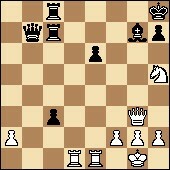 White has managed to win a pawn, but the Black passed pawn is a heavy counterweight on the scales. 30. Qh4 Threatening mate on the back rank. 30…Rg8 Another slight mistake. But who’ll condemn Grischuk for inaccuracies? Only someone who’s never been in time trouble himself. 31. Rd8?! And who’ll condemn Kramnik for the desire to exploit his opponent’s difficulties? 31…Rc8?! The times are: 0:10 – 0:02. Or to be more exact, Black has 0:01:44! Less than two minutes. 34. 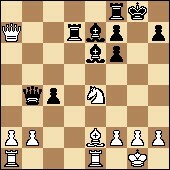 Qe4 Not blundering mate on g2. 35. Rc1 Rc8 36. 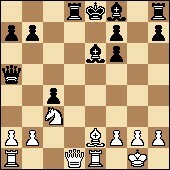 Qxe6 Look how many pawns White’s taken! But the one black one on c2 is worth many. 36…Rd8 Grischuk is walking a tightrope as his flag’s about to fall – he’s managed to make a lot of accurate moves! 37. Qb3 Rd2 It seems as though Black has enough counterplay to survive. Time trouble is over. Nothing but perpetual check is visible for White. Of course, during the time trouble stage of the game there were a great number of mistakes from both players. With your permission, I won’t try to analyse all the details. There’s no point. The players simply weren’t in a condition to calculate anything. They were playing almost on instinct alone (Translator’s note: literally, “with their hands”, in Russian), without their heads contributing. You can only admire the dexterity and endurance of Alexander Grischuk. His great predecessor, Harry Houdini, is nervously smoking on the sidelines – he wasn’t capable of such tricks. After going through all that it will no longer be enough for us – fans and commentators – to drink coffee. Cognac’s needed here! 41. Qe5+ Qg7 And what can White do? You can’t exchange queens because of the invasion of the black rook on d1. Playing with the queen on e1? That’s fraught with danger… Then Black would put his strongest piece on d4, renewing the threat of Rd2-d1. 42. Qe8+ Qg8 43. Qe5+ Qg7 44. Qe8+ DRAW! A disappointing miss for Kramnik. Yes, he had a dubious position after the opening, but then he managed to skillfully turn it around, exploiting the excessive thinking by Grischuk. What followed was a fantastically dramatic and nervous time trouble, in which Grischuk demonstrated phenomenal defensive qualities. He managed the main thing – not to let his flag drop and not to blunder anything. He’s a man of steel! And tomorrow the players will again have to cross swords in the tie-breaks… Thank you for your attention, dear spectators. Working for you has been Grandmaster Sergey Shipov. I take my leave of you in anticipation of tomorrow’s spectacle. All the best! And here Black, contrary to the established ideas and, I’d say, prejudices of previous years, exchanged the proud Grunfeld bishop on d4. In general, in our computer age, forcing concrete lines are beginning to dominate theory and people are starting, without any pangs of conscience, to get rid of pieces that they wouldn’t previously have parted with for anything. The chess greats of the past wouldn’t even have considered the move. […] Boris underestimated it, although no doubt his computer showed it as well. It seems he decided, in human terms, that it would be going too far. Shipov notes that Gelfand could actually have responded in kind with 15. e4! !, though the game finished as a logical draw. If any one thought, as Shipov admits he did at first, that the final position was good for White (who has the open c-file), then you can watch the video at 06:45 for a demonstration of why that isn’t the case. The first is Harry Houdini – the famous American illusionist who performed all kinds of tricks before his audience. He would be in a position where there was apparently no way of getting out, but then he’d escape. Then there’s Samuel Reshevsky, the American grandmaster who’d regularly end up in extreme time trouble – a minute for 15 or 20 moves – but would then go on to play brilliantly in time trouble. And finally our renowned Soviet grandmaster Efim Geller. Like Reshevsky he thought for a long time in the opening and middlegame and left himself literally seconds on the clock. Then he’d magically start to save himself. 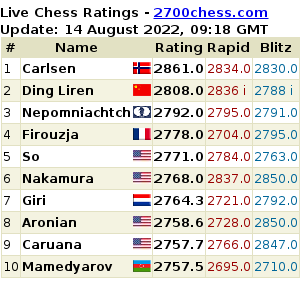 Well, Grischuk is continuing this famous series. He’s already worthy of standing on equal terms with them – even more so if he becomes World Champion. And now we’ll watch one of his latest tricks. White should have made a draw with 21. Qf4 [see the analysis at 16:55 in the video…] This is a very hard moment for a commentator, or a trainer. How can you evaluate such a move? The thing is, from an analytical point of view and objectively speaking, it’s quite a weak move. If you’re being strict you have to give it a question mark. But… from a practical point of view, and in his opponent’s time trouble, it created excellent winning chances – and Kramnik almost won. Grischuk also admitted himself that after 21. Qf3 it became uncomfortable for him. At 18:05 in the video Shipov demonstrates why 21. Qf3 fails to 21…f5. When he was told about the move in the post-game press conference, Kramnik suggested, 22. Ng3, and after 22…Bg5! playing 23. Rcd1. That runs into 23…Bd2, however, and Kramnik’s last suggestion of 24. Nf1 is met by 24…c3, leaving White in a very tricky situation. Shipov goes on to show Kramnik’s missed wins, e.g. 31. Nf4 (at 23:10) and 33. Nf6 (at 23:52), although he said of the potential 3 v 2 rook endgame that his analysis showed that Black could objectively hold in a study-like manner. Shipov corrected “wins” to “continuations leading to a big advantage”, though he did think Kramnik would have converted them. hope u didn’t OD on the cognac?? 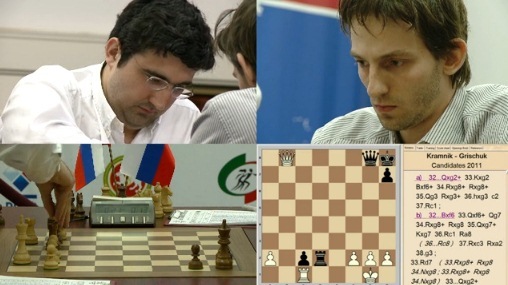 surely shipov (unless he ODed) would’ve done some sarcasm/pity on Kramnik’s thinking now? Thank you for bringing the very interesting commentaries to a wider audience, mishanp! Much appreciated!! It is great to see his touch of humor and that they are not lost-in-translation! Kudos! !